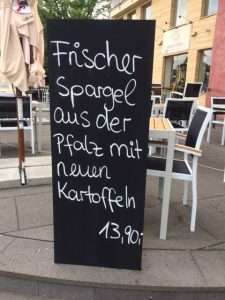 The first time Rudi and I came to Germany in 1990 when I was still looking for Nazis around every corner, we encountered a phenomenon that seems to continue today: Spargel mania. 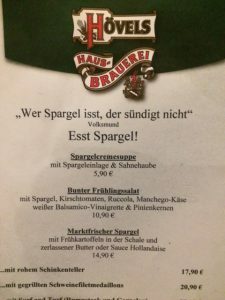 Spargel is the German word for asparagus, a vegetable I like more or less but don’t worship. Nor do I anticipate for months in advance the onset of the asparagus season. I don’t know if spargel is the official German vegetable, but it should be. That first experience in 1990 demonstrated to me how valued spargel is. Rudi and I went to lunch at a local restaurant in Heidelburg. I was focused on the number of dogs the diners had brought with them to the meal. It is perfectly OK for pets to join their owners inside or out and apparently German dogs are much better behaved than American ones. They all crouched docilely under the tables, not whining, begging or barking. 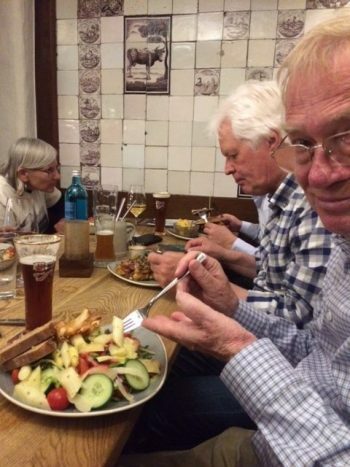 Anyway, the extraordinary thing in 1990 during our partaking of the spargel fest was that three spears of asparagus plus a very thin slice of ham was what we got when we ordered the lunch special. And it cost 10 marks (this was before the Euro). That was about $6. It wasn’t much lunch. Spargel definitely has not become a ho-hum offering. It’s everywhere we go and some menus have more than a dozen offerings, ranging from soup to a variety of combinations of spargel and different meat. The other thing to note is that we’re not just talking about green asparagus. Most of the venerated vegetable we are seeing yellow—a very light yellow with much thicker spears than what we’re used to. It’s in markets and special spargel stands are set up along the roadways. Which brings me, believe it or not, to another spargel story. Once, probably 15 years ago we were visiting Rudi’s cousin in Bavaria with two of our friends. As a treat, Hans had bought prodigious amounts of spargel and asked us to peel the bottoms of the stems. We told him we usually snapped them off. That horrified him when he realized we meant we’d discard at least a third of the stem. So, three of us sat there patiently peeling. The resulting delicacy was not exactly something I would describe as “to die for”. Our last ad final spargel story: spargel is not new as a German treat. Rudi’s mother made it was he was a kid. She served it with boiled potatoes and what he calls “a hugely expensive thin piece of ham” and store-bought Hollandaise sauce. The spargel was cooked for long time and the resulting dish was not his favorite. Rudi’s final comment about spargel mania: what would Freud have said? Julie Freestone and Rudi Raab are on a book tour in Germany. They’ve done 10 book events and eaten a lot of German food. Much more to come.